Shown here is the 21st Century Kon Tiki shortly after the main frame was constructed in South America. 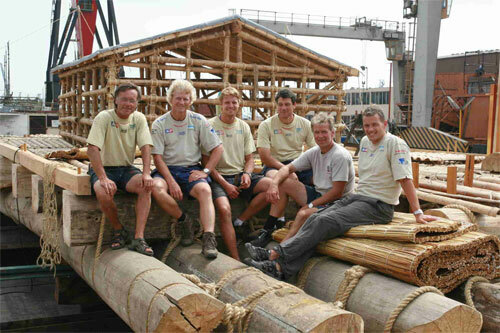 Thor Heyerdhal’s grandson is one of the crewmembers and is shown third from the left. This photo is particularly fascinating because it shows the link between the energy and fire of the explorer’s idea and how he makes it happen in the form of an engineered machine. Further, it depicts how this engineering marvel was made possible centuries ago with nothing more than stone tools and sweat. If mankind could do all that with a stone exe and sweat, think what we can do today with all our marvelous tools! Of course, that all leads me to mention one of my books. I am in the process of writing ABYSS OF SPACE. This book is the parallel novel to ABYSS OF ELYSIUM. In this book, there is an 11 year old child named Daryin who has built the ultimate idea machine. Like the men of Kon Tiki, all he had was his home computer and one ingenious idea. What was it? Well – you’ll have to read the book for yourself. But let us say that with his idea, he was able to fly to Mars – and all of my novels are based on reality. It should be out in late 2006! PS. Claudia and I will be away from the Florida desk making our way up to Stonebrooke Tennessee to continue writing furiously on ABYSS OF SPACE. We should be back on May 17th. Until then, my dear Aussie friend, Ralph Buttigieg has been left in charge of Quantum Limit. So now we hereby officially switch blogging hemispheres. I really can't wait to see what he has written when I get back!